The Wake Up Project: Can geoengineering put the freeze on global warming? Can geoengineering put the freeze on global warming? Once the domain of scientists' off-hours schemes scrawled on cocktail napkins, such geoengineering is getting a serious look in the political realm. "We're moving into a different kind of world," says environmental economist Scott Barrett of Columbia University. "Better we turn to asking if 'geoengineering' could work, than waiting until it becomes a necessity." A National Academy of Sciences' best estimate has global warming bumping up average temperatures by 3 to 7 degrees Fahrenheit by the end of the century. Meanwhile, greenhouse gas emissions that are largely responsible, most from burning the modern economy's main fuels, coal and oil, look set to continue to rise for the next quarter-century, according to Energy Information Agency estimates. "That's where geoengineering comes in," says international relations expert David Victor of the University of California-San Diego. "Research into geoengineering creates another option for the public." Geoengineering takes its cue from the natural experiment that actually had made the only dent in global warming's rise in the last two decades — the 1991 eruption of Mount Pinatubo in the Philippines, which blasted more than 15 million tons of sulfur dioxide 21 miles high, straight into the stratosphere. The stratosphere suspended those sulfur particles in the air worldwide, where the haze they created scattered and reflected sunlight away from the Earth and cooled global atmospheric temperatures nearly 0.7 to 0.9 degrees Fahrenheit in 1992 and 1993, before finally washing out, according to NASA Goddard Institute for Space Studies estimates. Firing about half that much sulfur into the stratosphere every year for 30 years would help stabilize global warming's rise, National Center for Atmospheric Research climate scientist Tom Wigley estimated in a much-debated 2006 Science journal report. Humanity would effectively become addicted to sky-borne sulfates to keep the cooling on track. The tradeoff is that rain and snow patterns would likely shift, a 2008 Proceedings of the National Academy of Sciences study found, consigning hundreds of millions of the poorest people on the planet in Africa and Asia to recurring drought. 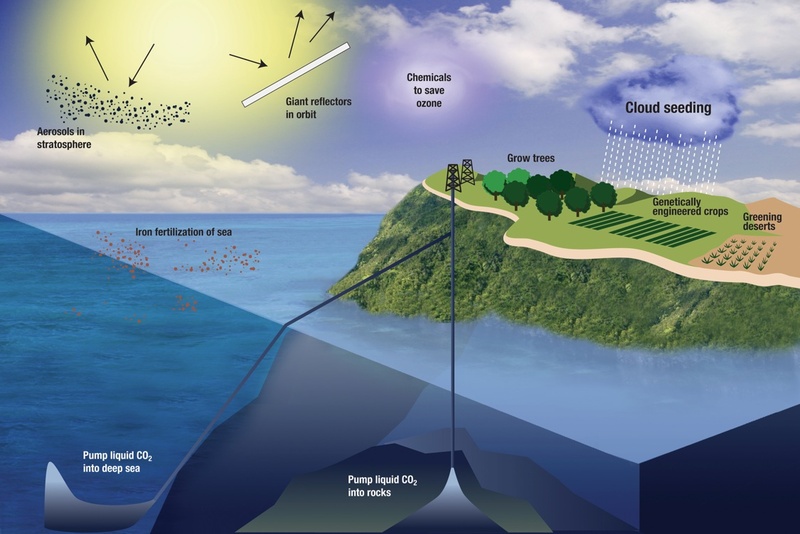 "Geoengineering is no longer a taboo topic at scientific meetings. They are looking at it as one more policy prescription," says Science magazine reporter Eli Kintisch, author of Hack the Planet: Science's Best Hope — Or Worst Nightmare — For Averting Climate Catastrophe. "But it is yet to become a household word." That may be changing, as the terms of debate about geoengineering become clear. On the pro-research side, this October the U.S. House Committee on Science and Technology called for more research into geoengineering, "to better understand which technologies or methods, if any, represent viable stopgap strategies for managing our changing climate and which pose unacceptable risks." On the more cautious side, a United Nations Environment Programme species conservation meeting in Nagoya, Japan, ended that same month with a call for, "no climate-related geoengineering activities," without environmental and scientific review. •Ocean fertilization. Dumping iron filings into the ocean to spur phytoplankton blooms is the saltwater version of forestation. The increased mass of the plankton's cells would swell with carbon pulled from the air. On the downside, it may kill fish, belch out other greenhouse gases such as methane, and hasn't worked very well in small trials. •Forestation. Intense planting of trees and reclaiming deserts with hardier plants is one of the ideas endorsed at the recent Cancun, Mexico, climate meeting, where representatives of 192 nations made some progress on an international climate agreement. More fantastic versions, endorsed by Princeton physicist Freeman Dyson, would rely on genetic engineering to produce trees that act as natural carbon scrubbers, their trunks swollen with carbon pulled from the air. •Cloud engineering. Painting rooftops white, genetically engineering crops to have shinier surfaces, and floating blocks of white Styrofoam in the oceans are all proposals to mimic the effects of clouds, whose white surfaces reflect sunlight. Pumping sea salt into the sky from thousands of "spray ships" could increase clouds themselves. Cost-effectiveness aside, such cloud-seeding might end up dumping rain on the ocean or already soggy regions, instead of where it's needed. •Pinatubo a-go-go. As mentioned above, sulfur aerosols could be fired into the sky by cannons, released by balloons or dropped from planes. •Space mirrors. Hundreds of thousands of thin reflective yard-long disks fired into a gravitational balance point between the sun and Earth could dim sunlight. Cost aside, rocket failures or collisions might lead to a tremendous orbital debris cloud circling the Earth. And a recent Geophysical Research Letters space tourism report suggests the rocket fuel burned to launch the needed number of shades would dump enough black soot — which absorbs sunlight and heats the atmosphere — to increase average global temperatures about 1.4 degrees. "Most of the technologies are not yet proven and are at the theoretical or research phase," an August Congressional Research Service report noted. On the environmental side, cutting temperature increases through these techniques may still shift rain and snow patterns, leaving the planet cooler, but it could also trigger droughts across vast swaths of farmland in Africa and India. Further, ocean fertilization could contribute to mass killing of sea life and releases of methane greenhouse gas, while using sulfur aerosols could bring not only drought but also enlarged ozone holes. Leaving aside the environmental risks each one carries, the estimated costs tend to increase with how quickly each method removes carbon or deflects sunlight. The space reflectors would top the bill at a cost of several trillion dollars over 25 years. "Geoengineering technologies, once developed, may enable short-sighted and unwise deployment, with potentially serious unforeseen consequences," said a 2009 American Meteorological Society statement. Turning over weather management to human beings raises, "legal, ethical, diplomatic, and even national security concerns," the statement added. Deflected storm tracks could result in floods such as the ones hitting Australia last month or Pakistan last year. And simply cutting temperatures won't stop the rise in ocean acidification arising from increased carbon dioxide levels in the air, which may affect marine life underlying the ocean food web. Simply putting a worldwide price on carbon emissions from smokestacks and letting the marketplace lead to lower carbon emissions would likely be cheaper and more sensible than geoengineering, says Barrett, the economist. "But let's face it. We're talking about (geoengineering) because we don't have a price on carbon." That's why geoengineering could happen before a global climate treaty ever passes the U.S. Senate, suggests Victor. International climate talks rest on getting 192 self-interested and short-sighted nations to cooperate in ways that will benefit some and cost others, particularly coal-powered ones such as the United States and China. But with geoengineering, you only need one nation to start "hacking," or geoengineering, the planet. "It would be not at all surprising to wake up one morning and discover that Chinese testing (of geoengineering) has begun on a large scale," Victor says. "That would freak everyone out and create huge international tensions." 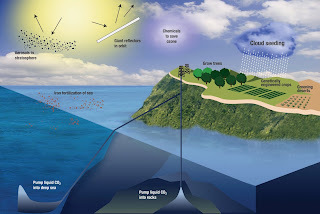 No international treaty governs geoengineering, other than a 2008 amendment to ocean pollution agreements limiting ocean fertilization to research studies. A Yale University survey of 1,001 people nationwide last year found that 1% could correctly describe geoengineering. The field needs to be researched, suggests climate scientist Michael MacCracken of the Climate Institute in Washington, D.C., before opinions harden without accurate information. Geoengineering at this point looks like one of many options in addressing climate change, MacCracken adds. "You can only geoengineer so much before the side effects become so much worse than the cure that it doesn't make sense to bother." He and others argue geoengineering research should begin in earnest, before some abrupt climate change, such as Greenland's ice sheet melting precipitously, stampedes the world into an overreaction and rush to costly technology as a quick, untested fix. "No research is really going on in a lot of these areas," he says, raising the prospect of a lot of fruitless or counterproductive climate engineering efforts suddenly sprouting in a global panic about collapsing ice sheets decades from now. Global warming by itself is a kind of geoengineering, noted as far back as 1896 by the Swedish scientist Svante Arrhenius, who calculated that doubling the amount of carbon dioxide (the most noted greenhouse gas) in the atmosphere by burning fossil fuels would likely warm the atmosphere by 9 degrees. Arrhenius supposed that would take thousands of years to happen, based on fossil fuel use rates at the turn of the century. Instead, the global average temperature has warmed about 1.4 degrees since he made his estimate, as carbon dioxide levels have increased tremendously, and his 9-degree increase is now within the range of forecasts for 2100. "I think it is settled that some climate engineering research will go forward," Kintisch says. "We haven't seen it enter the national debate yet. Hard to know what will happen when it does. That may be the biggest question." Please read up on Global Dimming.